The edge of the Anna Bay was the first place occupied by the settlers in the 16th century. They build a fort at the entrance of Sint Anna Bay, known as Fort Beekenburg. Later on a second fort was built at the opposite side of the first fort; Riff Fort. The entrance of the bay was of strategic importance to security and trade. The wharfs in the Anna Bay were of great importance for all the activity around the islands trade business, which formed a economic pillar at that time. Tall ships and schooners came from all around the globe with goods that were traded within the region. 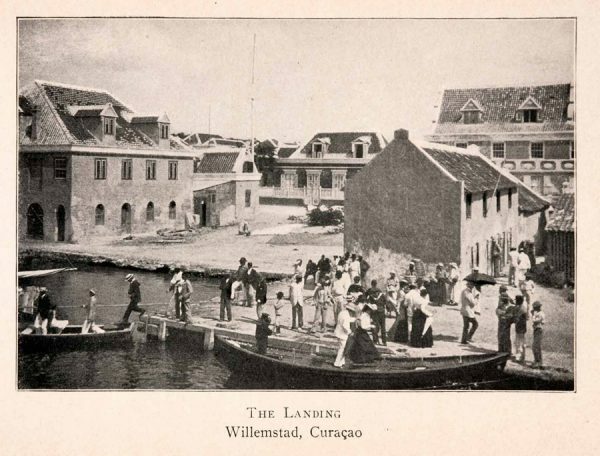 On and around the wharfs many warehouses were built and within the center a whole city was created; Willemstad was born. As the population grew many districts formed around the city center. Offices, factories and houses were built in these areas as the years progressed. Shops, markets, grocery stores, bars and guest houses were opened to accommodate the growing population. A population which also grew in welfare and which had more to spend. Willemstad was divided into 4 districts: Punda, Otrobanda, Scharloo and Pietermaai. The “nouveau riche”, first from dutch descendants then after from jewish origin, build large villas in Pietermaai and the popular Scharloo Area. Not a dime was saved to establish these big impressive baroque style mansions with beautiful gated patios and gardens. In the neighborhood there were parks and paths along the coastline for evening walks. First Scharloo Abou was partly a place for wharfs and warehouses and partly used for farming. The wharfs in this district were also used for shipbuilding and repair. After a strong hurricane destroyed many of the villas of jewish families in Pietermaai, so they looked for a safer location and many moved to Scharloo and Scharloo Abou. There they saw the opportunity to make a new start, away from the threats of large waves to hit the coastline. Therefor from around the 1870’s this district became popular residential area with large and lavish villas. Of which many are now the monuments which we cherish today. These stylish houses were built with elegant entrances, large stairs and big greek pillars. The thick walls were largely made out of the coral stone that was abundant on the island. The roof tiles and garden stones were imported from Holland. Living in this area was a privilege for the elite who earned their wealth from the trade business. At the beginning of the twentieth century Scharloo and Scharloo Abou were the richest and wealthiest neighborhoods of Curaçao. Its residents were referred to as “Hende di Scharloo”. There was even a tram connecting the different districts to Scharloo. At the beginning of the 20th century the Dutch Shell Oil Refinery build an oil refining factory in the Anna Bay. This brought about a big change in the economy and lifestyle on the island. The younger jewish generation moved out of Scharloo as the costs of maintaining these large villas and the lifestyle that comes with it kept increasing. Most couldn’t afford or didn’t want to carry the wages anymore of a driver, gardener, cook etcetera. They moved out of the city district to more modern concrete houses in new neighborhoods like Mahaai and Rooi Catochi. The popularity of the neighborhood decreased in following years, up until nearly all residents left this part of the island. Many villas were left to decay, were plundered and were a refuge for homeless people. On the other hand Fleur De Marie, a bario within the Scharloo Abou greater district, grew in population. The area became popular among the lower income class as well laborers from abroad that worked at the Shell. Small wooden houses were built on the hillside overlooking Scharloo Abou. Also packaging materials taken from the refinery, like tin cans, were used as building materials. In the 1980’s the revival of Scharloo and Scharloo Abou started as organisations and foundations became involved in restoring these mansions. The old colonial mansions and landhouses spread over the island became popular again. People finally understood that it is important to invest in our historic heritage. Some buildings were restored for living purposes, tough most for office space. 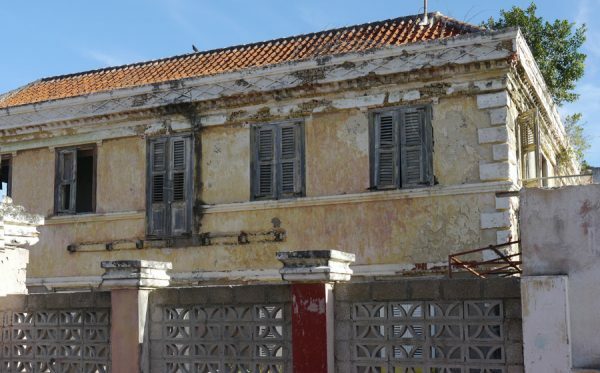 There was a growing consciousness that these great buildings of historical significance In Scharloo and Scharloo Abou needed to be saved and reused. The foundations Monumentenzorg Curacao, Stadsherstel Willemstad and Monumentenfonds were initiated to arrange and finance the restoration process and maintenance. It was a prestige for established organizations to open an office in a historical villa. Today you can find many banks, accountant offices, consulates and lawyers in Scharloo. Worth mentioning is that the inner city of Willemstad and its harbours were placed on the Unesco World Heritage list in 1997, which greatly stimulated awareness about preserving our rich past. During the last 5 years there is life in this part of town, with new initiatives starting every few months. Parke Leyba, a park square in the center Scharloo Abou, was opened in 2006. Stichting Monumentenzorg and Stadsherstel Willemstad, two leading organisations in restoration and maintenance of buildings in this district, changed their strategy from restoring and renting office buildings to a more multifunctional approach. It brought new life to this neighborhood! A more balanced mix of activities that form the beating heart of a small connected community is the new goal. In 2009 Creative Labs opened its doors, a co-working office concept, that attracted young entrepreneurs, startups, creatives and designers to the neighborhood. This concept has now broadened and renamed Workspot offering more work spaces. In 2016 Street Art Skalo was formed from within Creative Lab, an organization with the goal of converting Scharloo Abou into an art center full of wall paintings and art installations. In this part of town you can now get inspired by different beautiful art made by local artists. And they envision a lot more. Read all about this initiative here. Different boutique shops and lunch rooms have also opened their doors in the last years. Its owners envision a future in Scharloo Abou amidst a lively neighborhood that will grow into a trendy suburban center. If the plans of Curacao Ports Authority to build apartment complex on the Kleine Werf in Scharloo Abou are realized, the developments in this district will further accelerate and its community dynamics will be changed drastically and for the better.